Hydrobromination is the treatment of alkene with hydrogen bromide where alkane bromide is formed. In the first step, the proton is added to a double bond which the carbocation is formed. It can occur with either of two regiochemical possibilities. And this is either occur to form the less substituted, secondary carbocation or occur to form the more substituted, tertiary carbocation. Which of these two cases is favored? And why? As we know according to Markovnikov rule, the proton is added to less substituted carbon, whereby a more stable carbocation occurs. This means that in this case, it would be a tertiary carbocation. 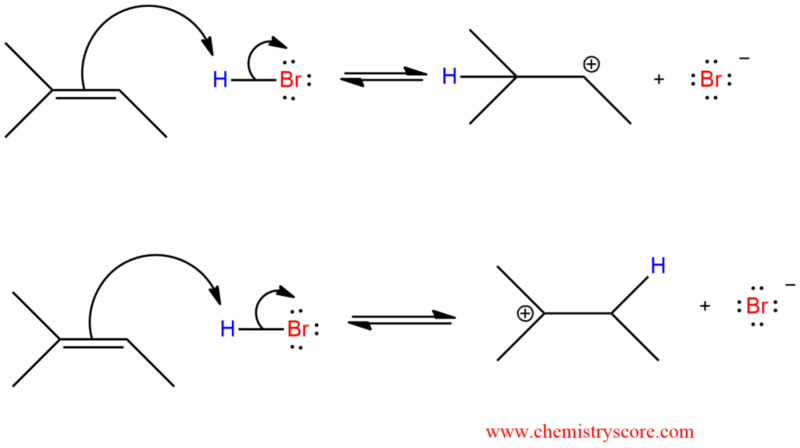 After that, in the second step, when a good nucleophile Br- is present, it comes to its addition. And the end product is quickly formed.